Eighty of Judge Brett Kavanaugh’s former law students sent a letter to the Senate on July 19 in support of Kavanaugh’s nomination to the Supreme Court. 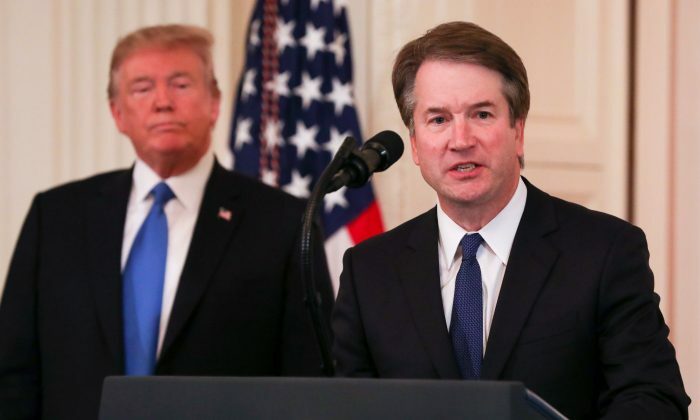 President Donald Trump nominated Kavanaugh on July 9 to replace retiring Supreme Court Justice Anthony Kennedy. Kavanaugh faces a series of confirmation hearings in the Senate, where Republicans hold a slim majority. Before that, his meeting with scores of senators in a bid to build support for his confirmation. In addition to teaching law, Kavanaugh has been a judge of the U.S. Court of Appeals for the District of Columbia Circuit since 2006. Trump picked Kavanaugh from a list of conservative justices curated by the Federalist Society and the Heritage Foundation. Republicans hold a 50-49 majority in the Senate, with one lawmaker on sick leave. At least four Democrats from states won by Trump in 2016 are considered swing votes. Three of the four voted for Trump’s prior nominee, Justice Neil Gorsuch, last year. The fourth swing vote, Sen. Doug Jones (D-Ala.), began his term in the Senate via special election after Gorsuch was confirmed.